The second book in my Chronicles of the Celestial series will be released mid September. I’m going through my final read before publication. The book will be available in paperback on Amazon. 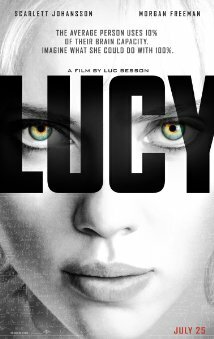 Lucy directed by Luc Besson and starring Scarlett Johansson and Morgan Freeman tells an interesting story about a young woman living in Japan that gets swept up into an international drug trade. The film opens with a so-called friend Richard, trying to convince Lucy to take a mysterious briefcase to someone that she doesn’t even know. Very reluctant to do this favor, Lucy denies his request and she is forced to put herself in a situation that will eventually change her life forever. Lucy enters the dark world of the unknown as she encounters a group of Japanese Mob men that basically plays Russian Roulette with here life. She is attacked and forced to smuggle drugs back into the US with an implanted bag of a synthetic pregnancy hormone. Lucy tries to rebel against her captors and is attacked once again. The bag explodes inside her, and the drug is released into her bloodstream as it opens up a whole new world of abilities that her brain unlocks. Lucy escapes the prison that she is being held in and soon reeks havoc upon everyone that was responsible for her pain and suffering. Lucy’s brain functioning is evolving by the minute. She seeks the help of Professor Norman, a Brain Scholar (played by Morgan Freeman, as she tries to cope with her new found intelligence. One by One she picks off the Japanese Mob crew. Her crusade to put an end to their plan starts a war between her and the Boss. He will stop at nothing to see her die and does everything in his power to make that happen. In the end Lucy meets allies on her journey for revenge and leaves the legacy of her intelligence behind for the professor. I thought the overall concept for this film was awesome and I could see the future makings of a great superhero film. I really enjoyed the special effects, but felt as though there were some unnecessary scene flashes such as the animals running in the beginning,it seemed out of place. The movie was too short, but I felt that the imagery was Sci Fi driven and the action scenes were engaging. I gave this movie 3 stars. The drive to work was always a trip of contemplations. Thinking about my parents burned bright on my mind. It’s never easy to survive tragedy and bounce back into the swing of everyday life. I never really paid attention to the low volume radio but the extra noise kept me company. I used to love waking up early to get my day started but lately I wasn’t much of a morning person. I lost my father in an accident, and my mother couldn’t handle the loss. She had a nervous breakdown and is in a mental hospital, so really I lost both parents in one awful moment. It’s a challenge for me to get up and go on with my life like nothing has happened. Just getting out of bed sometimes makes me feel like I am betraying my parents. Ever since the car accident I have excruciating headaches. I went into the kitchen and pulled out the drawer that my medication was in. At the moment I was taking prescription pain killers, sleeping pills, and sometimes anti-depressants. I hadn’t needed to take those pills in a long time. I tried to deter the pain from gaining force. If it didn’t, I was going to have to cancel my date with Christine and go straight to bed. The headaches are almost blinding at times, and literally feel like a hammer is banging inside of my brain. Every time I think about the trip I am reminded of the worst day of my life. I had just gotten back from a weekend ski trip in Aspen with some girlfriends, including Christine. It was mid-winter and my flight was delayed for several hours due to a terrible snow storm that hit the area. My dad, a surgeon at Milford General Hospital picked me up from the airport after a thirty-hour shift; the staff was low because of the storm so he decided to stick around to help out as much as he could. We were both pretty tired but it never occurred to me that dad was not in any kind of shape to drive. It was 4:45 on a Thursday morning, and it was dark and freezing cold. Sleet came down pretty hard, and made the roads very slick. It looked like dad was doing fine, and I always felt safe when he was behind the wheel. Mom was waiting for us with hot cocoa and I was so excited to see her and tell her about my trip. The ride was long and I dozed off a few times. I woke abruptly to the sound of skidding tires and a sudden swerving motion. Dad’s head was slumped down over the steering wheel, his glasses were crooked and his eyes were closed. “Dad! Dad! Wake up!” I yelled. I yanked off my seatbelt to shake him with force. The car was spinning out of control. His head bobbed up and down and his eyes lazily open and closed. I grabbed the steering wheel and tried to scoot over as close as I could towards him and reach for the break with my foot. The car was going too fast and bumped and swayed through the light traffic. The car sped up and then everything went black. 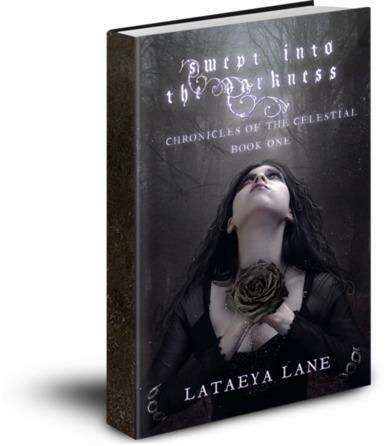 My debut urban fantasy novel Swept into the Darkness:Chronicles of the Celestial book one is in the process of being reviewed one last time before it is officially re-published. The process should be completed no later than midweek. As soon as the book begins the publishing process, I will start my official book promotion kick off with posting a few excerpts right here on my blog. 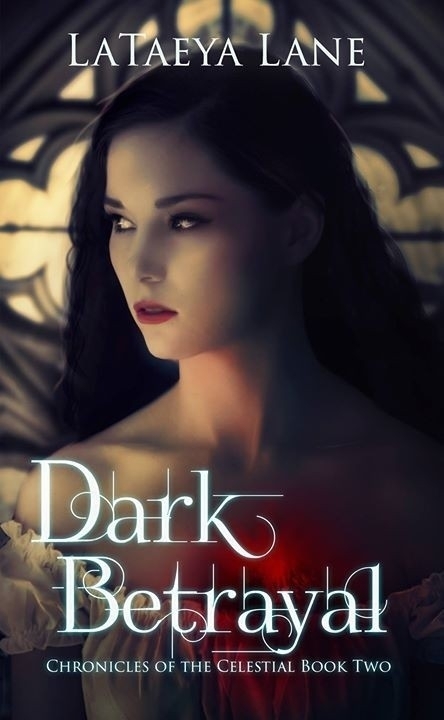 A book blast and tour will follow, along with an array of cool giveaways and prizes. All of my events will be announced on my blog, and via Facebook and Twitter.